RABBI ( = "my master"). Honor Paid to the Rabbis. The Old and the Modern Rabbi. Hebrew term used as a title for those who are distinguished for learning, who are the authoritative teachers of the Law, and who are the appointed spiritual heads of the community. It is derived from the noun , which in Biblical Hebrew means "great" or "distinguished," and in post-Biblical Hebrew, "master" in opposition to "slave" (Suk. ii. 9; Giṭ. iv. 4) or "pupil" (Ab. i. 3). In the Palestinian schools the sages were addressed as "Rabbi" (my master). This term of respectful address gradually came to be used as a title, the pronominal suffix "i" (my) losing its significance with the frequent use of the term. Nathan ben Jehiel, in the "'Aruk" (s.v. ), quotes the following passage from the letter addressed by Sherira Gaon to Jacob ben Nissim with regard to the origin and signification of the various titles derived from : "The title 'Rab' is Babylonian, and that of 'Rabbi' is Palestinian. This is evident from the fact that some of the tannaim and amoraim are called simply by their names without any title, e.g., Simon the Just, Antigonus of Soko, Jose ben Johanan; some bear the title 'Rabbi,' e.g., Rabbi Akiba, Rabbi Jose, etc. ; others have the title 'Mar,' e.g., Mar 'Uḳba, Mar Yanuḳa, etc. ; others again bear the title 'Rab,' e.g., Rab Huna, Rab Judah, etc. ; while still others have the title 'Rabban.' e.g., Rabban Gamaliel and Rabban Johanan ben Zakkai. 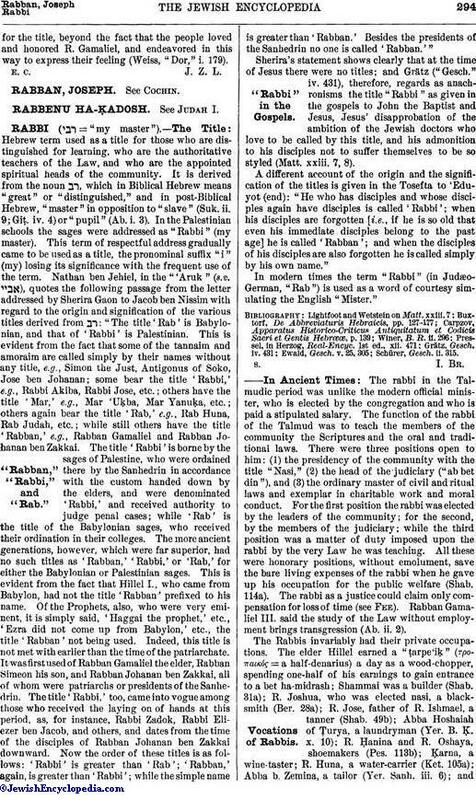 The title 'Rabbi' is borne by the sages of Palestine, who were ordained there by the Sanhedrin in accordance with the custom handed down by the elders, and were denominated 'Rabbi,' and received authority to judge penal cases; while 'Rab' is the title of the Babylonian sages, who received their ordination in their colleges. The more ancient generations, however, which were far superior, had no such titles as 'Rabban,' 'Rabbi,' or 'Rab,' for either the Babylonian or Palestinian sages. This is evident from the fact that Hillel I., who came from Babylon, had not the title 'Rabban' prefixed to his name. Of the Prophets, also, who were very eminent, it is simply said, 'Haggai the prophet,' etc., 'Ezra did not come up from Babylon,' etc., the title 'Rabban' not being used. Indeed, this title is not met with earlier than the time of the patriarchate. It was first used of Rabban Gamaliel the elder, Rabban Simeon his son, and Rabban Johanan ben Zakkai, all of whom were patriarchs or presidents of the Sanhedrin. The title 'Rabbi,' too, came into vogue among those who received the laying on of hands at this period, as, for instance, Rabbi Zadok, Rabbi Eliezer ben Jacob, and others, and dates from the time of the disciples of Rabban Johanan ben Zakkai downward. Now the order of these titles is as follows: 'Rabbi' is greater than 'Rab'; 'Rabban,' again, is greater than 'Rabbi'; while the simple name is greater than 'Rabban.' Besides the presidents of the Sanhedrin no one is called 'Rabban.'" Sherira's statement shows clearly that at the time of Jesus there were no titles; and Grätz ("Gesch." iv. 431), therefore, regards as anachronisms the title "Rabbi" as given in the gospels to John the Baptist and Jesus, Jesus' disapprobation of the ambition of the Jewish doctors who love to be called by this title, and his admonition to his disciples not to suffer themselves to be so styled (Matt. xxiii. 7, 8). 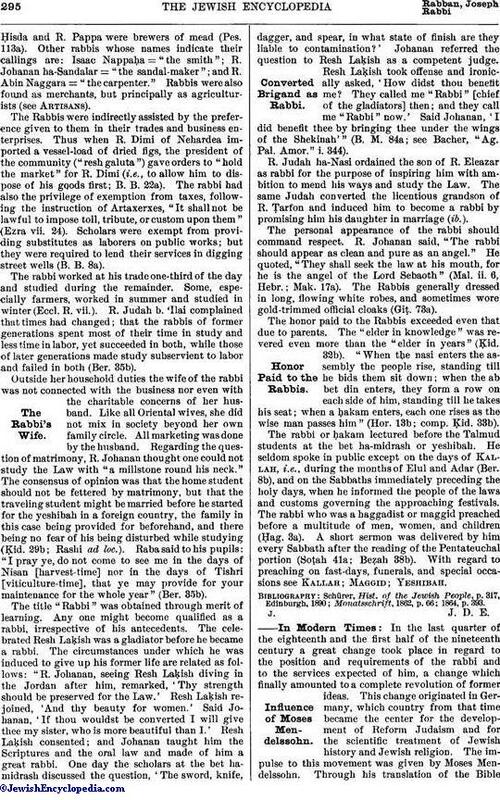 A different account of the origin and the signification of the titles is given in the Tosefta to 'Eduyot (end): "He who has disciples and whose disciples again have disciples is called 'Rabbi'; when his disciples are forgotten [i.e., if he is so old that even his immediate disciples belong to the past age] he is called 'Rabban'; and when the disciples of his disciples are also forgotten he is called simply by his own name." In modern times the term "Rabbi" (in Judæo-German, "Rab") is used as a word of courtesy simulating the English "Mister." The rabbi in the Talmudic period was unlike the modern official minister, who is elected by the congregation and who is paid a stipulated salary. The function of the rabbi of the Talmud was to teach the members of the community the Scriptures and the oral and traditional laws. There were three positions open to him: (1) the presidency of the community with the title "Nasi," (2) the head of the judiciary ("ab bet din"), and (3) the ordinary master of civil and ritual laws and exemplar in charitable work and moral conduct. For the first position the rabbi was elected by the leaders of the community; for the second, by the members of the judiciary; while the third position was a matter of duty imposed upon the rabbi by the very Law he was teaching. All these were honorary positions, without emolument, save the bare living expenses of the rabbi when he gave up his occupation for the public welfare (Shab. 114a). The rabbi as a justice could claim only compensation for loss of time (see Fee). Rabban Gamaliel III. said the study of the Law without employment brings transgression (Ab. ii. 2). The Rabbis invariably had their private occupations. The elder Hillel earned a "ṭarpe'iḳ" (τροπαικος = a half-denarius) a day as a wood-chopper, spending one-half of his earnings to gain entrance to a bet ha-midrash; Shammai was a builder (Shab. 31a); R. Joshua, who was elected nasi, a blacksmith (Ber. 28a); R. Jose, father of R. Ishmael, a tanner (Shab. 49b); Abba Hoshaiah of Ṭurya, a laundryman (Yer. B. Ḳ. x. 10); R. Ḥanina and R. Oshaya, shoemakers (Pes. 113b); Ḳarna, a wine-taster; R. Huna, a water-carrier (Ket. 105a); Abba b. Zemina, a tailor (Yer. Sanh. iii. 6); andḤisda and R. Pappa were brewers of mead (Pes. 113a). Other rabbis whose names indicate their callings are: Isaac Nappaḥa = "the smith"; R. Johanan ha-Sandalar = "the sandal-maker"; and R. Abin Naggara = "the carpenter." Rabbis were also found as merchants, but principally as agriculturists (see Artisans). The Rabbis were indirectly assisted by the preference given to them in their trades and business enterprises. Thus when R. Dimi of Nehardea imported a vessel-load of dried figs, the president of the community ("resh galuta") gave orders to "hold the market" for R. Dimi (i.e., to allow him to dispose of his goods first; B. B. 22a). The rabbi had also the privilege of exemption from taxes, following the instruction of Artaxerxes, "It shall not be lawful to impose toll, tribute, or custom upon them" (Ezra vii. 24). Scholars were exempt from providing substitutes as laborers on public works; but they were required to lend their services in digging street wells (B. B. 8a). The rabbi worked at his trade one-third of the day and studied during the remainder. Some, especially farmers, worked in summer and studied in winter (Eccl. R. vii.). R. Judah b. 'Hai complained that times had changed; that the rabbis of former generations spent most of their time in study and less time in labor, yet succeeded in both, while those of later generations made study subservient to labor and failed in both (Ber. 35b). Outside her household duties the wife of the rabbi was not connected with the business nor even with the charitable concerns of her husband. Like all Oriental wives, she did not mix in society beyond her own family circle. All marketing was done by the husband. Regarding the question of matrimony, R. Johanan thought one could not study the Law with "a millstone round his neck." The consensus of opinion was that the home student should not be fettered by matrimony, but that the traveling student might be married before he started for the yeshibah in a foreign country, the family in this case being provided for beforehand, and there being no fear of his being disturbed while studying (Ḳid. 29b; Rashi ad loc.). Raba said to his pupils: "I pray ye, do not come to see me in the days of Nisan [harvest-time] nor in the days of Tishri [viticulture-time], that ye may provide for your maintenance for the whole year" (Ber. 35b). The title "Rabbi" was obtained through merit of learning. Any one might become qualified as a rabbi, irrespective of his antecedents. The celebrated Resh Laḳish was a gladiator before he became a rabbi. The circumstances under which he was induced to give up his former life are related as follows: "R. Johanan, seeing Resh Laḳish diving in the Jordan after him, remarked, 'Thy strength should be preserved for the Law.' Resh Laḳish rejoined, 'And thy beauty for women.' Said Johanan, 'If thou wouldst be converted I will give thee my sister, who is more beautiful than I.' Resh Laḳish consented; and Johanan taught him the Scriptures and the oral law and made of him a great rabbi. One day the scholars at the bet hamidrash discussed the question, 'The sword, knife, dagger, and spear, in what state of finish are they liable to contamination?' Johanan referred the question to Resh Laḳish as a competent judge. Resh Laḳish took offense and ironically asked, 'How didst thou benefit me? They called me "Rabbi" [chief of the gladiators] then; and they call me "Rabbi" now.' Said Johanan, 'I did benefit thee by bringing thee under the wings of the Shekinah'" (B. M. 84a; see Bacher, "Ag. Pal. Amor." i. 344). R. Judah ha-Nasi ordained the son of R. Eleazar as rabbi for the purpose of inspiring him with ambition to mend his ways and study the Law. The same Judah converted the licentious grandson of R. Ṭarfon and induced him to become a rabbi by promising him his daughter in marriage (ib.). The personal appearance of the rabbi should command respect. R. Johanan said, "The rabbi should appear as clean and pure as an angel." He quoted, "They shall seek the law at his mouth, for he is the angel of the Lord Sebaoth" (Mal. ii. 6, Hebr. ; Mak. 17a). The Rabbis generally dressed in long, flowing white robes, and sometimes wore gold-trimmed official cloaks (Giṭ. 73a). The honor paid to the Rabbis exceeded even that due to parents. The "elder in knowledge" was revered even more than the "elder in years" (Ḳid. 32b). "When the nasi enters the assembly the people rise, standing till he bids them sit down; when the ab bet din enters, they form a row on each side of him, standing till he takes his seat; when a ḥakam enters, each one rises as the wise man passes him" (Hor. 13b; comp. Ḳid. 33b). The rabbi or ḥakam lectured before the Talmud students at the bet ha-midrash or yeshibah. He seldom spoke in public except on the days of Kallah, i.e., during the months of Elul and Adar (Ber. 8b), and on the Sabbaths immediately preceding the holy days, when he informed the people of the laws and customs governing the approaching festivals. The rabbi who was a haggadist or maggid preached before a multitude of men, women, and children (Ḥag. 3a). A short sermon was delivered by him every Sabbath after the reading of the Pentateuchal portion (Soṭah 41a; Beẓah 38b). With regard to preaching on fast-days, funerals, and special occasions see Kallah; Maggid; Yeshibah. Monatsschrift, 1862, p. 66; 1864, p. 393. In the last quarter of the eighteenth and the first half of the nineteenth century a great change took place in regard to the position and requirements of the rabbi and to the services expected of him, a change which finally amounted to a complete revolution of former ideas. This change originated in Germany, which country from that time became the center for the development of Reform Judaism and for the scientific treatment of Jewish history and Jewish religion. The impulse to this movement was given by Moses Mendelssohn. Through his translation of the Bibleinto pure German, Mendelssohn taught his people to speak the language of Germany, to read her classical authors, and to feel that they were integral parts of the nation in whose midst they lived; that the country of their birth was their fatherland. In this way he breathed new life into the sluggish masses and educated the German Jews to take an active part in the national literary and social life. Meanwhile some rabbis of even large congregations remained out of touch with the educated Jews. They came into contact with their constituents chiefly in the decision of ritual and ceremonial questions, and in the performance of certain legal acts, especially in connection with the laws of marriage and inheritance. Their literary activity was confined to casuistry, their opinions being rendered only in Hebrew. Some led lives so retired from the world that their influence upon the members of their congregations was scarcely perceptible. Many of them, though very learned in Talmudical lore, had not even the most elementary knowledge of the things essential to a common education. They could hardly make themselves understood in the language of their country. Some, again, addressed their congregations only twice every year, and then on subjects uninteresting to the great majority of their hearers. By the abolition of the specific Jewish jurisdiction, the rabbis' acquaintance with the civil law of the Jewish code, to which in former times the greatest attention had been paid, became unnecessary for most practical purposes, and the imperative necessity for a general education became obvious. 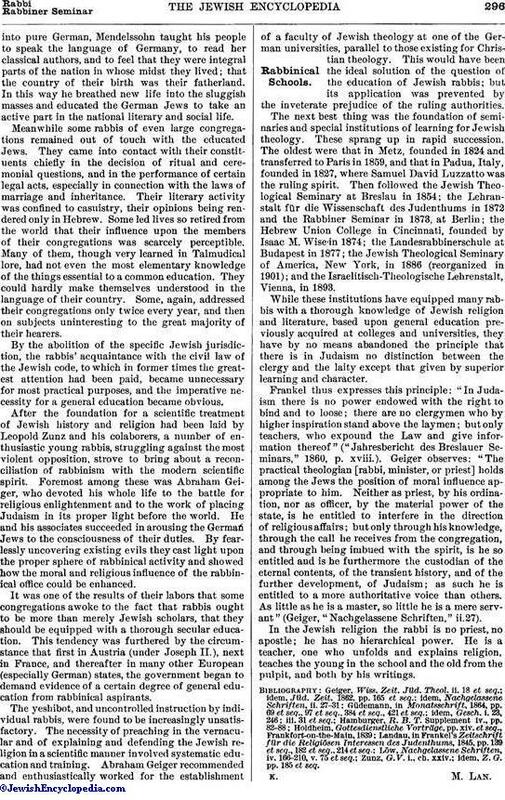 After the foundation for a scientific treatment of Jewish history and religion had been laid by Leopold Zunz and his colaborers, a number of enthusiastic young rabbis, struggling against the most violent opposition, strove to bring about a reconciliation of rabbinism with the modern scientific spirit. Foremost among these was Abraham Geiger, who devoted his whole life to the battle for religious enlightenment and to the work of placing Judaism in its proper light before the world. He and his associates succeeded in arousing the German Jews to the consciousness of their duties. By fearlessly uncovering existing evils they cast light upon the proper sphere of rabbinical activity and showed how the moral and religious influence of the rabbinical office could be enhanced. It was one of the results of their labors that some congregations awoke to the fact that rabbis ought to be more than merely Jewish scholars, that they should be equipped with a thorough secular education. This tendency was furthered by the circumstance that first in Austria (under Joseph II. ), next in France, and thereafter in many other European (especially German) states, the government began to demand evidence of a certain degree of general education from rabbinical aspirants. The yeshibot, and uncontrolled instruction by individual rabbis, were found to be increasingly unsatisfactory. The necessity of preaching in the vernacular and of explaining and defending the Jewish religion in a scientific manner involved systematic education and training. Abraham Geiger recommended and enthusiastically worked for the establishment of a faculty of Jewish theology at one of the German universities, parallel to those existing for Christian theology. This would have been the ideal solution of the question of the education of Jewish rabbis; but its application was prevented by the inveterate prejudice of the ruling authorities. The next best thing was the foundation of seminaries and special institutions of learning for Jewish theology. These sprang up in rapid succession. The oldest were that in Metz, founded in 1824 and transferred to Paris in 1859, and that in Padua, Italy, founded in 1827, where Samuel David Luzzatto was the ruling spirit. Then followed the Jewish Theological Seminary at Breslau in 1854; the Lehranstalt für die Wissenschaft des Judenthums in 1872 and the Rabbiner Seminar in 1873, at Berlin; the Hebrew Union College in Cincinnati, founded by Isaac M. Wise in 1874; the Landesrabbinerschule at Budapest in 1877; the Jewish Theological Seminary of America, New York, in 1886 (reorganized in 1901); and the Israelitisch-Theologische Lehrenstalt, Vienna, in 1893. While these institutions have equipped many rabbis with a thorough knowledge of Jewish religion and literature, based upon general education previously acquired at colleges and universities, they have by no means abandoned the principle that there is in Judaism no distinction between the clergy and the laity except that given by superior learning and character. 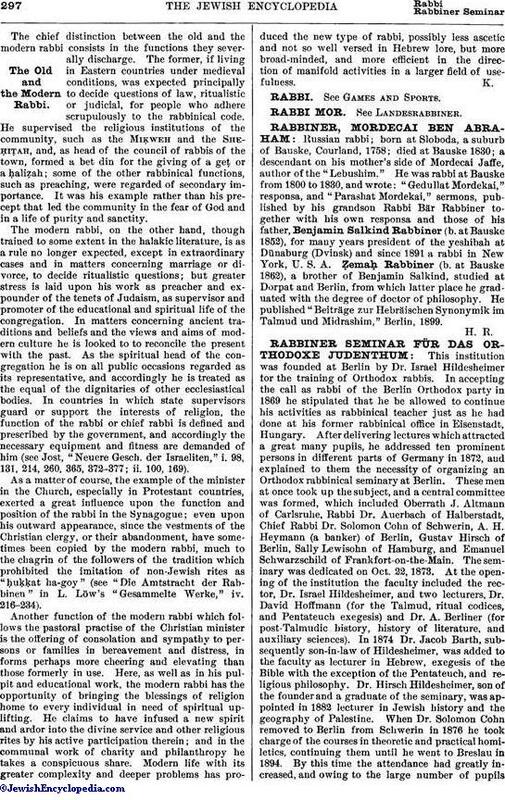 Frankel thus expresses this principle: "In Judaism there is no power endowed with the right to bind and to loose; there are no clergymen who by higher inspiration stand above the laymen; but only teachers, who expound the Law and give information thereof" ("Jahresbericht des Breslauer Seminars," 1860, p. xviii.). Geiger observes: "The practical theologian [rabbi, minister, or priest] holds among the Jews the position of moral influence appropriate to him. Neither as priest, by his ordination, nor as officer, by the material power of the state, is he entitled to interfere in the direction of religious affairs; but only through his knowledge, through the call he receives from the congregation, and through being imbued with the spirit, is he so entitled and is he furthermore the custodian of the eternal contents, of the transient history, and of the further development, of Judaism; as such he is entitled to a more authoritative voice than others. As little as he is a master, so little he is a mere servant" (Geiger, "Nachgelassene Schriften," ii. 27). In the Jewish religion the rabbi is no priest, no apostle; he has no hierarchical power. He is a teacher, one who unfolds and explains religion, teaches the young in the school and the old from the pulpit, and both by his writings. idem, Z. G. pp. 185 et seq. K. M. Lan.The Old and the Modern Rabbi. The chief distinction between the old and the modern rabbi consists in the functions they severally discharge. The former, if living in Eastern countries under medieval conditions, was expected principally to decide questions of law, ritualistic or judicial, for people who adhere scrupulously to the rabbinical code. He supervised the religious institutions of the community, such as the Miḳweh and the She-ḥiṭah, and, as head of the council of rabbis of the town, formed a bet din for the giving of a geṭ or a ḥaliẓah; some of the other rabbinical functions, such as preaching, were regarded of secondary importance. It was his example rather than his precept that led the community in the fear of God and in a life of purity and sanctity. The modern rabbi, on the other hand, though trained to some extent in the halakic literature, is as a rule no longer expected, except in extraordinary cases and in matters concerning marriage or divorce, to decide ritualistic questions; but greater stress is laid upon his work as preacher and expouṇder of the tenets of Judaism, as supervisor and promoter of the educational and spiritual life of the congregation. In matters concerning ancient traditions and beliefs and the views and aims of modern culture he is looked to to reconcile the present with the past. As the spiritual head of the congregation he is on all public occasions regarded as its representative, and accordingly he is treated as the equal of the dignitaries of other ecclesiastical bodies. In countries in which state supervisors guard or support the interests of religion, the function of the rabbi or chief rabbi is defined and prescribed by the government, and accordingly the necessary equipment and fitness are demanded of him (see Jost, "Neuere Gesch. der Israeliten," i. 98, 131, 214, 260, 365, 372-377; ii. 100, 169). As a matter of course, the example of the minister in the Church, especially in Protestant countries, exerted a great influence upon the function and position of the rabbi in the Synagogue; even upon his outward appearance, since the vestments of the Christian clergy, or their abandonment, have sometimes been copied by the modern rabbi, much to the chagrin of the followers of the tradition which prohibited the imitation of non-Jewish rites as "ḥuḳḳat ha-goy" (see "Die Amtstracht der Rabbinen" in L. Löw's "Gesammelte Werke," iv. 216-234). Another function of the modern rabbi which follows the pastoral practise of the Christian minister is the offering of consolation and sympathy to persons or families in bereavement and distress, in forms perhaps more cheering and elevating than those formerly in use. Here, as well as in his pulpit and educational work, the modern rabbi has the opportunity of bringing the blessings of religion home to every individual in need of spiritual uplifting. He claims to have infused a new spirit and ardor into the divine service and other religious rites by his active participation therein; and in the communal work of charity and philanthropy he takes a conspicuous share. Modern life with its greater complexity and deeper problems has produced the new type of rabbi, possibly less ascetic and not so well versed in Hebrew lore, but more broad-minded, and more efficient in the direction of manifold activities in a larger field of usefulness.